When you live near Idaho Falls, Idaho, there is one thing you can always count on. A wonderful winter. Or a horrible winter. This all depends on how you look at it. One of our agents here at The Group Real Estate loves the crisp air and the winter time. Some people who live around here love the winter, there are some who are indifferent, and there are a lot of people here who hate the winter. 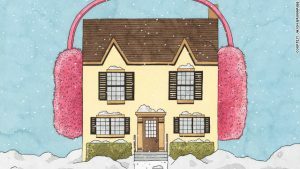 Whichever of these you may be, or whichever category explains who you are, here some great tips to winterizing your home, in preparation for a gnarly winter or a tame one. If you have gutters on your home, this is the first place to go before the snow starts to fall and the freezing weather start to… well… freeze. Clean your gutters out. You want water to flow quick and freely through the gutters. This will eliminate scary icicle and ice dams that can fall down, that are a pain to clean out, especially inside the gutters, if they have frozen over and over in the gutters. We all have water heaters. We all want to shower in warm, or hot, water, we want to have warm water to help the start of our hot cocoa, and we want hot water for our dish washer. During use, and especially over time use, of your water heater, there are particles and sediment that can collect at the bottom of the water heater. There is usually a drain valve at the bottom of your water heater. Make sure you use this to flush out the water, as this will clear out the material and keep your heater running smoothly through the winter. One of the more simple changes is just switching over the way that your ceiling fans spin. When they are spinning clockwise they actually push the heat that rises quicker through the roof to keep the ceiling warmer, than not. Your central air and heating systems have filters in them to keep them going over time. Making sure to change these filters regularly, especially before and during the winter months, will help even more with the longevity of your central air or heating systems. One that is really over thought, and isn’t the most fashionable tip, is putting window insulation film over your windows. This has been proven to keep 70% of your heat from leaking out the window, keeping the inside of your home at an optimal temperature. Heat is known for escaping out from underneath the doors in most homes. A simple trick for this, that will cost you anywhere between ten dollars and fifteen dollars, is investing in some draft guards. If you don’t want to shell out for the draft guards, you can put down a rolled towel and place it at the bottom of the exterior part of the door. This will also keep the warm in, and the cold outside. The next thing, that has such similarity to this, is weatherstipping. Make sure that you are using these to seal up the cracks that are just naturally there on your window seals, especially if you have windows that are made to open and close. Make sure if you live in an exceptionally cold area, that you have fiberglass insulation around basement doors, windows, and unused rooms. Also, make sure your attic has fiberglass insulation, as well. AC units need to have this in them, as well, or they will break in the freezing weather. If you are applying this on your own, make sure you are wearing gloves! Installing a programmable thermostat now will help you save a lot of money, by keeping the temperature down when you’re not at home. This will help you program in specific temps when you aren’t around, or during the night when you aren’t there to regulate it. If you have windows, doors, or cracks that are extra drafty, compared to the ones you have weatherstripped or put draft guards on. If you have some places that truly need filled, to keep warmth in, you will want to invest in some caulk. You can get a basic caulk gun and a tube of caulk for around $30, altogether. If it continues to be chilly, make sure that you pull off the moldings and fill all gaps in the insulation. If you have a chimney, this is one place that lets a lot of heat and warmth out of your house. The best route is to invest in a $55 chimney balloon when you are winterizing your home. This will make sure to keep drafts out and heat in. There are many other tips that you may want to look up. One of these is winterizing your pipes. There are plenty of great tips online for this one. As we move into the winter months, coming soon, please make sure that your home is ready to take on any kind of winter that we may encounter.